CAD File Converter is the key that gives you access to drawings in the most common CAD formats, by making them compatible with your own graphic programs - even if not the latest versions - visualising them and printing in PDF format. It can import drawings in DWG, DXF and DXB from version 12 to the most recent version, as well as drawings and maps in every kind of DWF format, compressed and uncompressed. All drawings can be quickly visualised in a preview or transformed into DXF and DWG, again - versions 12 to 2011, in DWF binary, ASCII, compressed or uncompressed. Import-export of various DWG, DXF and DXB formats from versions 12 to versions 2011. Drag and drop support. 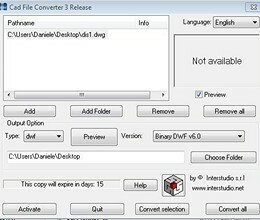 File and folders can be dragged into the CAD File Converter Window. * Cad File Converter download link provides trial version of the software for Windows and Mac. 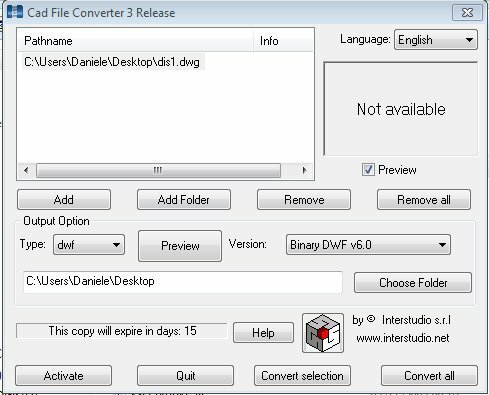 Cad File Converter has been rated 5.0 out of 5 points. A total of 2 votes cast and 0 users reviewed the software.